Celebrities are THE fashion icons for beauty, makeup — and of course, hairstyles. Toni Braxton is no exception. That’s why we’ve got Toni Braxton photo galleries, pictures, and general beauty news on this celeb. Her style is totally inspiring and worth checking out. So if you’re searching for some beauty tips, hairstyle options, and fashion advice, turn to Toni Braxton. She’ll bring your fashion to a whole new place. 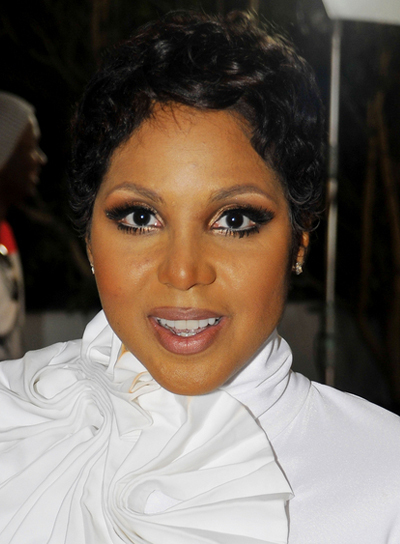 Toni Braxton's layered hairstyle is great for relaxed, African-American hair. To get the look: 1. To start, apply a texturizing product and roughly blow dry hair. 2. Then part your hair down the middle and blow dry the front sections straight using a boar bristle brush (pull the brush in different directions for a quirky, haphazard look). 3. Use a curling iron to curl the ends of your hair in the back to add a little flair.